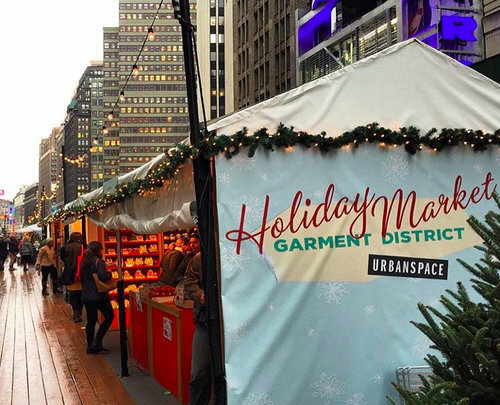 NOV. 20, 2017 @ 11 A.M. – DEC. 24, 2017 @ 8 P.M.
Two blocks of holiday cheer comes to the Garment District in November for our UrbanSpace Holiday Market. Twenty five vendors will be on Broadway for five weeks, allowing you to proscrastinate to any level you’re comfortable with when buying gifts for loved ones this holiday season. The market will open on November 20th at 11am across two plazas between 39th and 41st streets on Broadway. I Am Here Brooklyn – Handmade jewelry, fine art and home goods made in Brooklyn, NY. La Sonrisa Empanadas – Emapandas back again! Dani and the rings Jewelry collection, handmade, New York City, micropavé, diamonds. JustStars Beautiful light up stars. No user commented in " Garment District Holiday Market "